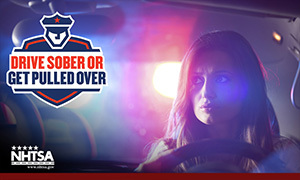 The National Highway Traffic Safety Administration (NHTSA) once again launched its annual "Drive Sober or Get Pulled Over" campaign set to run through Labor Day on Sept. 7. In partnership with 10,000 law enforcement agencies across the country, the campaign is an effort to crack down on drunk driving. Motorists can expect that Arizona law enforcement across the state will be out in force showing zero tolerance for drivers with a blood alcohol concentration (BAC) of .08 or more. Despite national trends that show that the number of drunk drivers has decreased in recent years, according to the Arizona Governor's Office of Highway Safety, the number of DUI arrests increased from 503 in 2013 to 582 in 2014. However, even one drunk driver greatly increases the risks for not only themselves, but also everyone else on the road. In 2013, the NHTSA reports that one third of all motor vehicle accident fatalities involved a drunk driver. Sixty-eight percent of the deaths that year involved a driver with a BAC of .15 or greater. According to the NHTSA, the majority of drunk driving accidents occur at night, between the hours of 6 p.m. and 5:59 a.m. Half of all night-time fatalities involve a drunk driver. With the lowest Labor Day gas prices since 2004, experts expect an influx of motorists to be hitting the road for the holiday weekend. This also allows for an increase in the number of drunk drivers on the road. The NHTSA says that your best defense against drunk drivers is to wear a seatbelt. If you do have too much to drink, do not get behind the wheel. Rather plan ahead to have a designated driver or find a cab or alternative ride home. If you or someone you love is injured an accident with a drunk driver this holiday weekend, do not hesitate to contact a personal injury lawyer from the offices of Phillips Law for a free case evaluation. Our accident attorneys can help you get the justice and compensation you deserve. Call or text 1-800-706-3000 to get started today.